The Branch Line Britain website has been put together by Mark Chatterton, who has liked trains and railways ever since he was a young boy. In fact wherever he has lived, he has always lived within a mile of a railway line! As a boy he went to school by train every day and became a keen train spotter in his early teens, travelling all over the country. Although he is no longer a train spotter, he does enjoy travelling regularly on the railway lines of Great Britain. 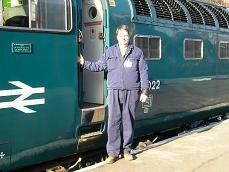 Through family history research he has discovered that his paternal great-grandfather worked at Crewe Works, and his maternal grandfather worked at Lostock Hall engine shed.